An ancient Egyptian temple at New York’s Metropolitan Museum of Art provided the setting for Chanel’s latest catwalk show, when the French fashion house debuted a collection featuring glittering tweeds, golden garments and bold jewels. 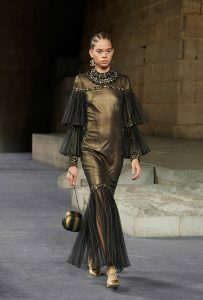 The catwalk looped The Met’s Temple of Dendur – an Ancient Egyptian monument completed in 10BC – to create an appropriate setting for the debut of Chanel’s 2018/19 Métiers d’art collection earlier this week. With a taste for elaborate shows, creative director Karl Lagerfeld chose the decorative sandstone temple to provide the backdrop for the presentation, as well as inform the Egyptian-style aesthetic of the pieces.”Egyptian civilisation has always fascinated me: I get inspired by an idea, which I make a reality,” said Lagerfeld in a project statement. Floating regal garments, bold geometric prints and lavishly colourful accessories featured throughout the collection, along with plenty of golden garments in sparkling, shimmering and crackled textures. Beige, white and black tweeds – a Chanel staple – are threaded with mohair, gold and beaded cotton. Other motifs included the Ancient Egyptian scarab beetle, which can be seen a necklace, buttons, belt buckle, earrings and handbags, while the models’ makeup resembled the Eye of Horus. The presentation at The Met marks the 17th edition of the annual Métiers d’art showcase, which always takes place in December outside of the seasonal shows. Each year, a different city provides both the setting and the influence, with previous locations including Tokyo, Monte Carlo, London, Moscow and Shanghai. The showcase at The Met is also particularly monumental for the maison, as Chanel is only the second fashion brand to host a show at the museum, following Valentino in 1982.